What do you get when you pair the extremely capable D500 with the AF-S NIKKOR 200-500mm f/5.6E ED VR lens and the MB-D17 battery pack? A kit that lets you capture even the most challenging sports & wildlife photos. With its Multi-CAM 20K autofocus system with 153 AF point coverage, and up to 750mm equivalent field-of-view with the AF-S NIKKOR 200-500mm f/5.6E ED VR, this kit will allow you to lock onto your subject and track it across the frame while capturing at speeds of up to 10 fps for up to 200 shots. And, once you’ve captured those elusive moments, you can admire them on the D500’s high resolution tilt touchscreen display and share them easily via the built-in SnapBridge (Wi-Fi® + Bluetooth) function. Also included are 2 SONY 32GB G Series XQD Memory Cards, an extra EN-EL15 battery and a 2 Year Extended Service Coverage (ESC) on the D500 body. The new Multi-CAM 20K autofocus system provides 153 AF points including 99 cross type points, which together enable you to create images that match your vision. Combining speed, precision and responsiveness, the D500’s autofocus system is ideal for fast action scenes and difficult to capture subjects such as wildlife or sports. The D500’s superior buffer and 10 frames per second capability can keep up with any action without breaking a sweat. Unleash the power of the D500 and capture all the action as it unfolds without fear of missing the shot. When using the D500 with an XQD card, you can capture up to 200 shots* with one continuous burst at a frame rate of 10 fps—this kind of speed and power is one of the reasons the D500 is so well equipped for sports and wildlife scenes. And with the MB-D17 attached, you get nearly twice the shooting capacity of just a single in-camera battery—perfect for extended shooting at sporting events or out in the field. The accessory grip can also be used with its AA battery holder in case you are in a pinch and need some extra battery life. *Buffer of 200 shots when using XQD card with 400MB/s Write Speed. The D500’s 20.9MP DX format CMOS sensor isn’t just designed to deliver spectacular quality images. Its smaller DX format means you're able to get closer to your subject while still being able to use Nikon’s legendary line of NIKKOR lenses. How much closer? 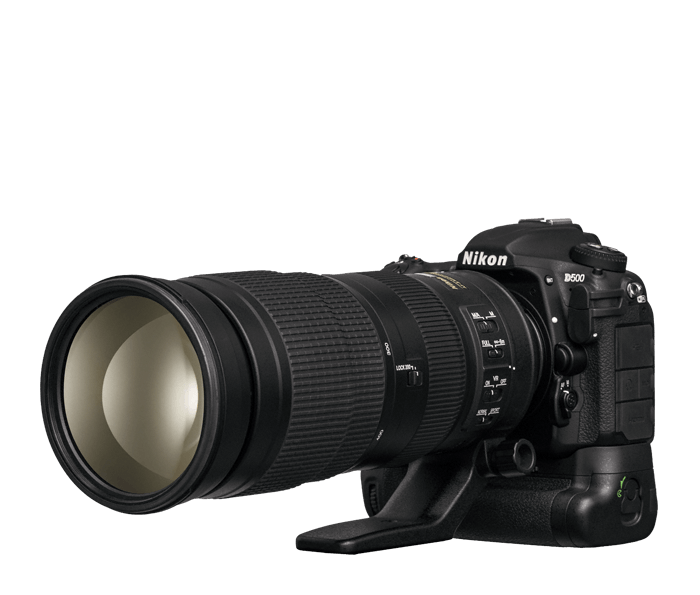 On the D500, the included AF-S NIKKOR 200-500mm f/5.6E ED VR lens delivers a 300-750mm equivalent field-of-view. Together with the D500’s Multi-CAM 20K autofocus sensor, this powerful combination ensures you can get crisp, sharp photos while staying close to the action. As the sun goes down and the perfect blend of composition and light presents itself, the D500 will be ready to help you capture it in all its glory. With an incredible ISO performance of 100-51,200 (expandable to 1,640,000 equivalent), the D500 can deliver stunning image quality, even as the light fades. When you find yourself wanting to stop action in its tracks, you’ll find this ISO range to be particularly useful in order to leverage a faster shutter speed—this will mean the difference between a soft or sharp photo. Created with the sports & wildlife photographer in mind, this kit includes all you need to get take your photography to the next level. Paired with the AF-S NIKKOR 200-500mm f/5.6E ED VR, 2 SONY 32GB G Series XQD memory cards, an MB-D17 Multi Battery Power Pack, an extra EN-EL15 battery and Nikon 2 Year Extended Service Coverage, the D500 is fully equipped to keep shooting even in the most demanding environments.